Now I know what it must have been like seeing “Star Wars” for the first time all those years ago. It gets harder and harder each year to be truly blown away at the movies these days. And after ten Marvel movies spanning the past six years it seemed unlikely any of the best ones (Iron Man, Captain America: The Winter Soldier) could ever be topped. “Guardians of the Galaxy” is a comic property that is not very well known and director James "Slither" Gunn and his entire team have crafted a glorious space adventure. I was hesitant going in that this other worldly saga could be a bunch of nonsense like the underwhelming “Green Lantern” movie or even the snoozefest that was “JohnCarter.” However, “Guardians of the Galaxy” with its superb cast, effects, and killer soundtrack offer yet another winning comic extravaganza that is worth every Marvel Cinematic Universe fan’s time. I’m the last person that enjoys movies set in other worlds or on other planets. But when we’re introduced to Peter “Star-Lord” Quill as a young boy who runs off after losing his mother and gets abducted by an alien pirate spacecraft we immediately have someone to identify with. It also helps that, even as an adult (now played by the charming Chris Pratt) the rogue outlaw carries around his 80s Walkman filled with catchy golden oldies and is constantly throwing out familiar pop culture references (and even an funny not-very-subtle masturbation reference) that tend to confuse his alien companions. He’s exactly what Gunn and co-writer Nicole Perlman have used to help us Earthlings relate to this story of intergalactic intrigue. And it works like a charm. Soon Peter, er, Star-Lord, finds an orb artifact that everyone and their mother seems to want to get their hands on (including main baddie the blue-faced Ronan played by Lee Pace). We don’t care about it but everyone else does, but I digress. Soon Peter, who insists on being called by his Star-Lord moniker, is imprisoned with a pair of bounty hunters: a wise-cracking raccoon named Rocket (voiced by Bradley Cooper) and a tree-like creature named Groot (voiced by Vin Diesel). Assassin Gamora (Zoe Saldana) is also after the orb. 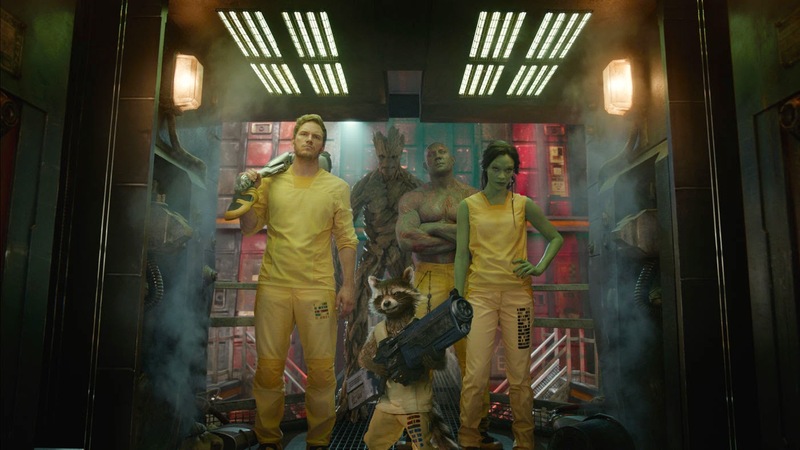 This unlikely group of misfits hesitantly join forces to escape prison, along with fellow strongman inmate Drax (wrestler Dave Bautista), and into a plotline that eventually involves guarding the galaxy. Oh and there’s Glenn Close and John C. Reilly. I’d be lying if I said that I fully grasped every single plot element and wasn’t confused here and there, but you know what? I never really bothered me. There are so many weird characters but they all get a moment to shine and you always get a sense as to what everyone’s deal is. The chemistry between all the actors works wonders. Rocket, who has some great lines, and the nearly wordless Groot (his lines are mostly limited to “I am Groot!”) might be the best onscreen pair of the year. The best part of “Guardians of the Galaxy” is that it’s just plain fun. The plot almost seems to take a backseat so that the audience is never bored. If you begin to pick apart the plot you may get a sense that most of it is all generic nonsense. It basically comes down to bad guys want device to destroy the galaxy for no other reason because that’s what bad guys do in movies like this. Theatrical Trailer for Guardians of the Galaxy on TrailerAddict.